Barbary Coast Las Vegas hotel wants 1031 exchange sale to Harrah’s Las Vegas in exchange for 24 acres of Las Vegas real estate near Stardust Las Vegas hotel, the future Echelon Place Las Vegas by Boyd Gaming Corp. Harrah’s Las Vegas has the land under contract to purchase from third parties, said Boyd Gaming. The Las Vegas land transaction will give Boyd 87 contiguous acres on the Las Vegas Strip and the ability to develop future phases of its multibillion-dollar Echelon Place project, which is replacing the Stardust Casino. The addition of Barbary Coast will give Harrah’s control some 350 acres on the Strip. Clark County assessor data shows that the 15-acre Westward Ho real estate carries a value of $101.6 million, while the Yarrow land parcel is worth $43.2 million. 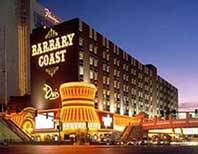 Barbary Coast Las Vegas land is valued at $15.7 million by the assessor. In September 2005, Texas-based home builder Centex Destination Properties and North Dakota hotel developer Tharaldson Cos. bought the 15-acres of land for $145.5 million, with Centex as the managing partner. They planned to build a Las Vegas high-rise condominium project. Boyd says its transaction would be an IRS 1031 exchange. It expects to recognize a non-cash gain of approximately $280 million in the quarter in which the transaction closes. The estimated closing quarter is the first quarter of 2007. Boyd Gaming plans to report results from Barbary Coast as discontinued operations beginning in the third quarter. Call 702-505-6988 for VIP 1031 Exchange services for Las Vegas commercial, land or residential by a Las Vegas real estate agent. Selling, buying or refinancing a piece of Las Vegas Real Estate today? Visit Fine Homes Real Estate for more information and VIP representation by a Las Vegas Luxury Real Estate REALTOR for investment Las Vegas Real Estate, 1031 exchange, condos such as Trump Towers Las Vegas, Turnberry Towers, Allure, Panorama Tower, The Signature MGM Residences, W Residences, RED Rock real estate, commercial, residential and Las Vegas land. Barbary Coast Las Vegas in 1031 exchange for Las Vegas real estate near future development of Echelon Place Las Vegas.